One thing I can’t predict is the weather or wind, and it turned out that we had a fair amount of the latter this past weekend when Hurricane Matthew chewed up Florida’s east coast. Big storms like Matthew produce winds on both coasts. However, it looked like our fish didn’t really care. Trout and reds ruled the inshore waters all along the Big Bend and grouper are edging closer to shore as each day passes. I can predict the tide—or at least I have the ability to read tide charts. And it looks like this upcoming weekend will be one of those with low(ish) tides around daybreak and nice flooding highs at mid-day. This means a couple of things for you inshore anglers: 1.) the fish will be staging up offshore of the shoreline, sometimes by a mile or so, waiting for the bait to ride the tide shoreward, and 2.) that you’d better watch your skeg and boat’s bottom carefully, as close-to-shore fishing along our stretch of Gulf coast can be pretty scary. If you’d like to see living proof of what the Big Bend bottom can do to a boat, take a look at the bottom of my skiff, Photo Opportunity, the next time you’re at the Sea Hag Marina in Steinhatchee. It’s a mess, but I get close to the fish—and catch them! 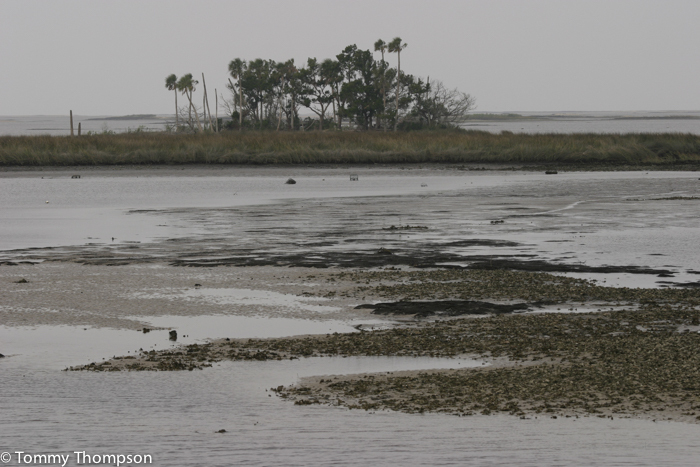 Low tide at Yankeetown, in Levy County, can get VERY LOW on fall mornings! 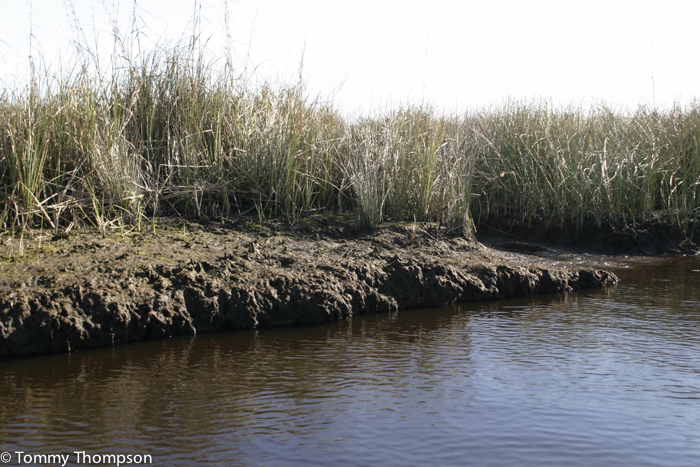 Yankeetown—Go out the river to the “Bird Cage” and head due north (slowly—the water’s low!) towards the Trout Stake. As the tide rises, throw topwaters and drift towards Porpoise Point and into Lows Bay. When you get really close to the islands and rocks, give some gold Johnson spoons a try for those big reds. Cedar Key—I think the best bet here will be the bars (the Jug Bar) and the cuts south of Snake Key. Work the edges of the cuts until the tide lets you get up to the south side of the island. Another good spot on the flooding tide will be the oyster bars along the south side of North Key, and the water between the shoreline and Deadmans Channel. 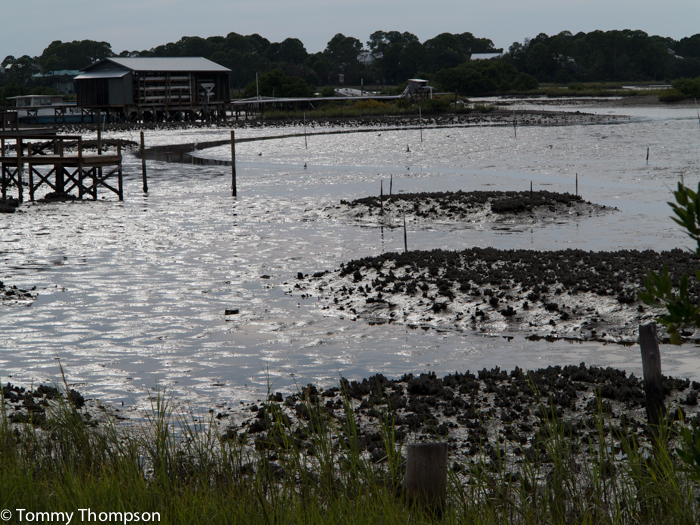 Low tide in the backwaters of Cedar Key! Suwannee—I’d head out the McGriff Channel to deeper water and then ease south towards Cedar Key. All those islands and bars and creeks south of Suwannee hold lots of fish, and as the tide rises, they’ll start attacking schools of white bait and mullet. Try the north and west shorelines of Deer Island, too. You might even take a peek inside Barnett Creek just to have a look around and get your bearings for winter trout fishing there. Creeks near Suwannee can get shallow, but they hold lots of trout and reds in the fall. Horseshoe Beach—Get well offshore (north from marker #10—slowly, with your motor trimmed up) and head northwest. Then, take your time drifting from the end of Pepperfish Keys to the creek mouths and bars between Horseshoe Beach and the Keys. Reds and trout have been all over that area for the last few weeks. You can run closer to shore on the way back to the ramp, but take it easy going through the bars along the channel next to the boat ramp. Steinhatchee—The shallow cove between Rock Point and Dallus Creek should be loaded with trout and reds this weekend, especially when the mid-day high tide pushes bait up into the grass. Just remember that that mile between the offshore bars and Rock Point will likely hold little water until mid-morning. Topwater lures like Super Spooks and Skitter Walks will be successful. Gold spoons will work better along the grassy shoreline. Offshore—Offshore fishing, as you probably already know, is about the same from all our ports. It’s just a matter of how far you’ll have to run to find the fish. Fair to good catches of red and gag grouper are showing up, as well as some serious amberjacks. Start by trolling in 40-feet, but plan to run to 70-feet if necessary. Don’t neglect to fill your live well with pinfish, too. That’s what the big fish are looking for this time of year.